Naut’sa mawt Tribal Council is run with guidance from an Elders Council with representatives from its 11 member nations. The Salish Sea Sentinel is profiling a new elder from the council each month. Tla’amin Elder Elsie Paul has represented her community on Naut’sa mawt Tribal Council’s Elders Council since July of 2016. Her traditional name is qaʔaχstaləs, which came from her great grandmother Annie Assu from Cape Mudge. She was born in 1931 on the Tla’amin reserve and was raised by her grandparents Jim and Molly Timothy. Her culture has been engrained in her because of her close ties to her grandparents. Elsie has six living children, three who have passed on, as well as 17 grandchildren and 15 great-grandchildren. Elsie has regularly been involved in community work at home in Tla’amin and in the wider area of Powell River. For four years, she was the elders’ representative for Vancouver Island University’s Powell River campus, where she would give students an introduction to Tla’amin culture and history. For seven years, Elsie served as a justice of the peace for her community of Powell River. She believes that people should build good relationships with our neighbours. She is often invited to do openings for various gatherings in her area. 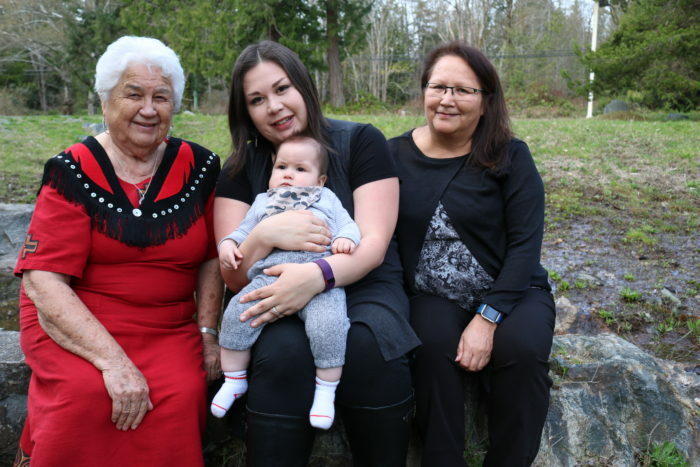 Notably, Elsie released a book titled Written As I Remember It: Teachings (Ɂəms tɑɁɑw) From the Life of a Sliammon Elder in collaboration with scholar Paige Raibmon and Raibmon’s granddaughter Harmony Johnson. The book tells Elsie’s life story and the history of her people in her own words. She is also focused on preserving the Tla’amin language and is currently working on a dictionary. “Ideally we are all the same and we all need to step out of our self-doubt,” she said in an interview. Elsie, you are a remarkable and precious gift to us. Thank you for all you have done and continue to do for our future.